I recently saw the second episode of James Cameron’s “Story of Science Fiction” series in which a German who had lived under Hitler expressed his opinion of Robert Heinlein’s “Starship Troopers.” In this book, Earth is attacked by a race evolved from “bugs” and goes to war. What is skewed in this German’s interpretation is that American soldiers, represented by the starship troopers, he equates with being the same as the Nazi fascist soldiers of Hitler’s Germany. Not the bugs who practice absolute rule over their species and strike out to annihilate the human race from their territory. To him, American soldiers are not the liberators and rescuers of the world, but the conquerors and oppressors. How does someone liberated from the Nazis come to believe that his liberators are the same as his enslavers? The same question can be asked today of blacks in America of why they went back to the Democrat Party to live as welfare voter slaves after Republicans freed them from slavery a hundred and fifty years ago? And why do they now believe that Republicans are the racist oppressors? The answer is – effective propaganda indoctrination of the ignorant. People of intelligence recognize propaganda for what it is – a smear campaign to deceive people of the truth. Unfortunately, the majority of people in this country are susceptible to it, which is why Trump’s approval rating is at 38% rather than 98% for all the good he is doing America. This is just proof that propaganda, like The Force, has a strong influence on the weak-minded. Liberals may conclude like Anakin Skywalker for that to mean that The Force is the evil in the universe because it is used against criminals. Republicans are not all conservatives and Democrats are not all liberals, but they do constitute the majorities of their respective bases. Not all Republicans are Christians and not all atheists are Democrats. Not all old people vote Republican and not all young people vote Democrat. Not all educated people understand the facts and not all ignorant people follow blindly. Humanity is very complex, but it can be simplified as Right and Left, with the Right being righteous and the Left being wrong. But leftists will not allow people the basic understanding of right vs. wrong because they know they are on the wrong side of that equation. So, they generate confusion by creating different paradigms to assign to these entities as rightwing and leftwing with their own flaws. They portray the two as having “extremes” with the far rightwing being Nazis and the far leftwing being Communists with themselves in the “enlightened center” as socialists. But being American is about rejecting socialism as the leftist ideology it is and embracing capitalist liberty as a righteous ideology. To the Left this is what makes America evil. Part of that confusion comes in the form of ignorance not understanding that both sides use the same weapons, but with opposite goals. Both America and Nazi Germany used the same guns and bombs, tanks and planes and other weapons to wage war on each other. They also used the same propaganda to motivate their people and incite and inspire them against the enemy. The difference was in the motivation and desired results of each ideology. For Nazi Germany the goal was conquest of their neighbors to rule by oppression. For America the goal was the liberation of their neighbors to rescue them from oppression. The confusion of liberals who do not understand these basic facts is why they see America soldiers as being no different than Nazi soldiers. Both kill, both rain destruction upon the civilian populace, both have soldiers who commit crimes and atrocities, and both use the same weapons of war. For the simple-minded the basic motivation is meaningless when the results look the same. They do not comprehend that Nazi victory resulted in millions enslaved and slaughtered, while America victory resulted in millions liberated and saved. A good rule of thumb by which to perceive any political argument is; believe none of what Democrats say and only half of what Republicans say because when it all comes out in the open it is always the Left that is proven to be 100% false! Like Comey exonerating Hillary after detailing her crimes, and Horowitz declaring the FBI had no bias in their investigations after detailing their bias, the Left speaks with forked tongues from two faces. 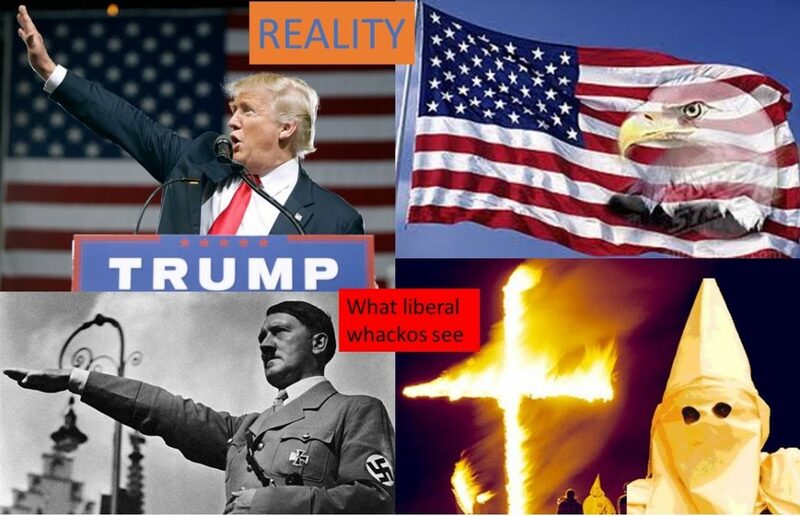 Nothing the liberal media says can be believed, even when what they say is true, because they distort it with their anti-Republican, anti-American, anti-Christian bigotry. Democrats create problems by which to manufacture crises they have no intention of solving but use to slander Republicans. This is the kind of mentality that only tears down and destroys rather than build anything except a coalition of hate. This is a leftist mantra that Democrats take to heart. They make laws to keep the righteous in line, but for themselves to break. They don’t care that Trump is adhering to the laws written by Congress. They expect servants of the government to break those laws whenever leftists see fit as their corrupt agents in the FBI have been doing. This is not the attitude of citizens, but of criminals. When they say they don’t want to change the law but for Trump to make an executive order to override it, they are not doing so for any reason other than to smear him. They would not laud him for his compassion but slander him as a tyrant. That is why his voters are proud of his standing firm and doubling down against these double-dealing liars. Americans can either wake up to the fact that the Democrat Party is the party of criminals or end up being corrupted to serve under them and have their wealth stolen.